If we forced the poor (and middle class) to save a little more, could we fix wealth inequality in America? It didn’t have to be this way. Even with stagnating incomes, the rest could have done a better job building and keeping wealth. 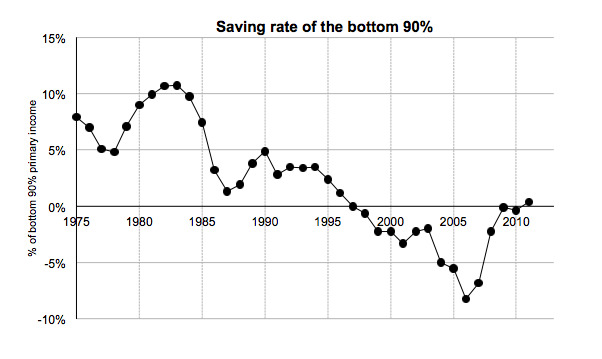 If the bottom 90 per cent had continued to save 3 per cent of its income over the 1986-2012 period, its share of US wealth would be a third higher than it is today. It’s essentially blaming non-rich people for not being rich. Did 90% of Americans wake up in the 1980s and say to themselves: “Retirement is for losers. I’m gonna go buy a new TV” (over and over, each paycheck, for 40 years)? Probably not. Saez/ZucmanFigure 11 from the Saez-Zucman paper. The key point here is that these debts driving down the savings rate, for the most part, are not optional expenses for the bottom 90%. People need somewhere to live, and they have to keep up with increasing tuition if they want to go to college. Necessary fixed costs increased while incomes stagnated, so saving gave way to debt in order for people to maintain the same lifestyle they had in previous decades. 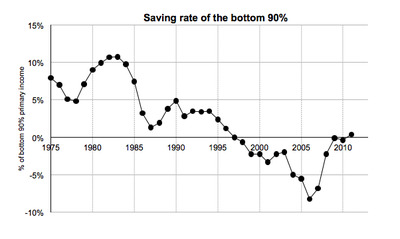 The bottom 90% then lost out on wealth accumulation, not just because they didn’t save money, but because that money then missed out on the kinds of capital gains the rich enjoyed as the stock market surged and their saved money became worth much more. But it is hard to blame people for thinking they should be able to live the same way today as they did yesterday. So is the solution forcing people to save? Thompson thinks one solution is direct deposit, because “somebody with her paycheck directly deposited into a savings account has to take active measures to spend her money.” But that assumes people take money out of savings for mostly spontaneous reasons, which is not the case with mortgage and student loan debt. Saez and Zucman have another proposal to nudge behaviour toward saving: a new automatic retirement plan that skims 3 per cent of annual earnings up to $US100,000. The money would go into a savings account invested in a broad fund to keep its growth near the global return on capital. Individuals could only take money out of the account early for special reasons, like buying a house or going to school. It’s a clever idea. It’s also a sign that Americans who aren’t rich still must be taught that being wealthy starts with not spending money. This is a rather selective reading of Saez and Zucman’s conclusions. They do suggest the 3 per cent plan, after writing that “the best policy to encourage middle-class saving depends on the reasons for the observed drop in the saving rate of bottom 90% of families.” We could force people to save, or we could think about boosting income growth, getting serious about consumer protection, and finding ways to stop college tuition from spiraling upward. But that’s a lot harder to do than just blaming the cash-strapped for not having enough cash.